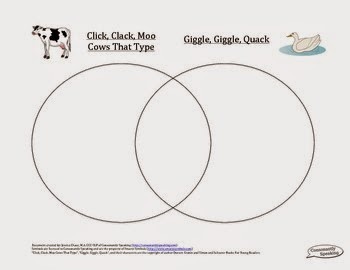 Speechie Freebies: Comparing and Contrasting "Click, Clack, Moo" and "Giggle, Giggle, Quack"
Comparing and Contrasting "Click, Clack, Moo" and "Giggle, Giggle, Quack"
I haven't been here for a while as a content creator (other than Friday FreeBEES posts on the Speechie Freebies account). I would like that to change as I really enjoy creating free materials for all of you! Now that my wedding is over, there is no more wedding planning in the way! Hopefully you will see a lot more of me around! 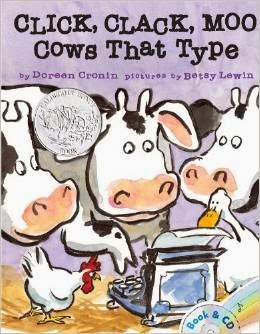 At the beginning of last year, I started off the third week with two incredible books by Doreen Cronin: "Click, Clack, Moo: Cows That Type" and "Giggle, Giggle, Quack"! Both books have characters with fun personalities, some shared characters, and both take place on a farm! However, there are some great differences between them as well! That is why I created a simple venn diagram to compare and contrast the two books! You can download the freebie over at my blog by clicking the venn diagram image below! I wanted to use more literature in my sessions, so my vocabulary groups did a lot of comparing and contrasting of books in the same series! There are more books in the "Click, Clack, Moo" series, including a Halloween themed one! I can't wait to check that one out this year! 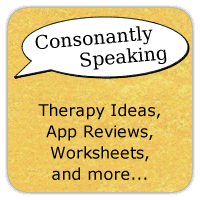 I hope you find this freebie helpful in your own practice!